Here we are again, in another blog train journey with Scraps and Pieces! April´s theme is Early Spring, and we have very soft, dreamy colors. If you are following the train, you probably came here from Studio Linda Renee, which is a blog I really like, and have been following for some time now. Well, back to business: I deceided to make an alpha for you. Thinking on my Brazilian friends, I put some of the accented letters we use, like á and ó. I hope you this alpha, and please, leave me comments if you download. Edit: As no one complained about direct download, it´s now my way of choice to share files. I removed the alternate link. If you had troubles with it, please comment below. Thank you so much for the alpha! Thank you for the alphabet. This is a beautiful train. Thank you for the alpha. Love your alpha, thank you very much! Thank you for your part of the blog train. 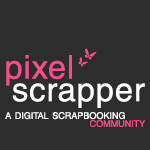 I am looking forward to using your kit in my scrapbooking.